Palazzo Lantieri is in a strategic position at the centre of an area rich in natural beauty and full of fascinating places to visit of great historical interest and age-old artistic traditions. From Palazzo Lantieri it is easy to reach nearby Slovenia and discover such attractive localities as the source of the Isonzo river, the Triglav National Park or the picturesque Bled. Cultural and historical centres of outstanding significance such as Aquileia, Cividale, Duino, Sistiana, Trieste and Venice are close by. Those seeking a relaxing holiday instead need look no further than the nearby wellness centre situated on the charming Isola del Sole, at Grado, where a range of services is provided. There are a wealth of sporting opportunities to be had in the surrounding country: from golf (the courses at Capriva del Friuli, Grado, Lignano and Trieste are renowned), to cycling (there are good cycle paths both throughout Friuli and in the province of Gorizia). For sailing enthusiasts, nautical itineraries offer alternative ways of discovering places such as Grado, Aquileia, Marano Lagunare, Valle Cavanata, Duino and Sistiana, while those who prefer exploring on foot have numerous opportunities for trekking in the Carso region, on the paths of the CAI (Italian Alpine Club). Treat yourself to some examples of the excellent local culinary tradition. The visitor to Palazzo Lantieri is well placed to explore the food and wine of the surrounding area, with visits to the wine cellars of the Italian and Slovenian Collio where the best of the Region’s wines, such as the famous Bianco del Collio, are waiting to be discovered. And finally, thanks to the Società Mitteleuropea della Caccia a Cavallo (Central European Society for Hunting on Horseback), visitors may take part in an ancient tradition themselves: every year, the Society organizes about five hunts in which riders may range over the borders into Slovenia and Austria, and as far as Makkpuszda in Hungary. Palazzo Lantieri is situated at the foot of the Castle in the historical centre of Gorizia, 6 Piazza S. Antonio. 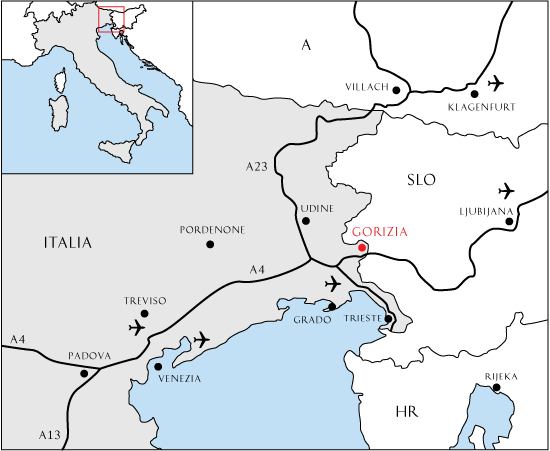 It is very easy to reach Palazzo Lantieri: from the A4 Torino/Trieste motorway – exit at Villesse and follow the signs for Gorizia. Palazzo Lantieri is about 25 Km (20 min.) from Ronchi dei Legionari, Trieste International Airport, 90 km (60 min) from Venice’s Airport, and it is 70 km (50 min.) from Ljubljana’s Airport.